Does the Philippines’ South China Sea Case Against China Really Matter? On July 7, the Arbitral Tribunal at The Hague began its hearing on the case submitted by the Philippines against China regarding its South China Sea claims. As we get bombarded with news updates in the coming weeks, it is important to keep the broader significance of the case in mind. In terms of principle, the case is important because it is a bold attempt to begin to untangle the knotty South China Sea disputes through the rule of law rather than the might makes right approach that China has been using over the past few years. 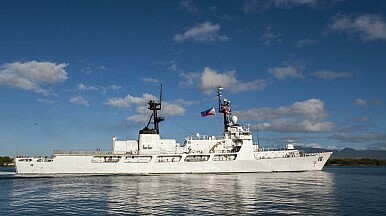 Since 2009, China has increased its assertiveness in the South China Sea, including by seizing Scarborough Shoal from the Philippines in 2012, forcibly moving an oil rig into Vietnamese waters in 2014, building artificial islands, and encroaching even into the southernmost extent of its nine-dash line reaching into Malaysia and Indonesia (See: “Malaysia’s South China Sea Approach: Playing it Safe“). This disturbing and destabilizing pattern has continued despite repeated protests that it violates the United Nations Convention on the Law of the Sea (UNCLOS), other agreements like the 2002 Declaration on the Conduct of Parties Beijing inked with Southeast Asian states, and general principles like the peaceful settlement of disputes (See: “Does ASEAN Have a South China Sea Position?“). What is the recourse for smaller states when a larger actor is breaking the rules and infringing on their rights? And is there a way to impose some kind of diplomatic cost on the offending state? This is where the case comes in. While various states have been crying foul and appealing to international law, there is no substitute for a neutral court making a decision on legal questions based on a common set of rules. This is what Philippine Foreign Secretary Alberto del Rosario meant when he said to the tribunal earlier this week that the court’s decision has global significance because it has an “impact on the application of the rule of law in maritime disputes.” In addition to the capitals world over that will be monitoring the decision closely, Malaysia, Indonesia, Vietnam, Thailand and Japan are directly observing the proceedings after being permitted to do so by the court, even though it declined to open the hearing to the public. How does principle translate into practice? In the case, the Philippines is asking the court to rule on the validity of China’s nine-dash line as a maritime claim; the status of individual features that China occupies; and Beijing’s interference in Philippine activities in the South China Sea. If, in the best case scenario, the court largely rules in Manila’s favor on these questions, it may push China to significantly redefine its illegal nine-dash line. Since other South China Sea claimants have also registered their opposition to or sought clarification about China’s claims in this respect, the decision would benefit them as well in trying to settle their disputes with Beijing further down the line. It also has broader importance for other actors like the United States and Japan, since China’s claims and the way it secures them has increased tensions over freedom of navigation and overflight (See: “How Would the US Challenge China in the South China Sea?“). However, as significant as this case is, it is also important to point out that the extent to which it matters both in principle and its practice will depend on several factors. The first is the way the court rules. Procedurally, the court will begin by first determining if it has jurisdiction and whether the Philippines’ claims are admissible before deciding on the merits of the case itself. Assuming it gets down to the merits of the case, even those sympathetic to the Philippine position know that its case is far from a clear-cut one. Indeed, the court may very well decide in Manila’s favor on some, but not all of its claims (eg. agree that the nine-dash line is not a valid maritime claim but not agree on the legal status of certain features). In this instance, in practice Beijing would be able to just modify the nine-dash line but still maintain its claim to most of the waters there through claims generated from these features. While that would make China’s claims less extensive and clearer, it would be a much more limited victory than Manila and its supporters would like. More generally, in principle, a ruling that is only partly in favor of the Philippines would also muddy the waters and be less in line with the moral clarity that some prefer on the case. That bleeds into the second factor which affects the significance of the case – which is China’s own response to the decision. China has already declined to participate in the case while continuing its assertiveness in the South China Sea, including the construction of artificial islands which it claims it is winding down for now (See: “The Truth About China’s South China Sea Land Reclamation Announcement“). Looking ahead, given its past behavior, Beijing is expected to ignore a ruling that is against its favor on the basis that the tribunal – in its view – lacks jurisdiction. In this case, its assertiveness in the South China Sea would continue. Alternatively, even if – either due to intense diplomatic pressure, its own volition, or a mix of both – Beijing ignores the court’s decision and modifies the nine-dash line further down the line, as stated earlier it may choose to do so to a very limited extent that is insufficient to mollify the concerns of other claimants. If these factors end up reducing the significance of the case drastically, the consequences could be dire not just for the Philippines, but other countries as well. For the Philippines, there may be general cynicism about the legal route, especially since Manila has had to suspend some of its military and economic activities in the South China Sea while pursuing this case while Beijing has been free to do as it pleases while refusing to participate. Indeed, some have already questioned the wisdom of the Philippine quest for the ‘moral high ground’ since it risks widening the already glaring asymmetry between it and Beijing for an uncertain outcome (See: “The Truth About Philippine Military Modernization and the ‘China Threat’“). For other claimants, it could send a clear and concerning signal that for all the rhetoric, rule of law is rather ineffective in reality when it comes to curtailing Beijing’s assertiveness, and that they must increasingly look to further developing their own capabilities to preserve their claims. The legal route is not the only tool that these smaller claimants have, but it is the only one where they get a fair hearing relative to China and the outcome is not rigged in the latter’s favor. Beijing’s relative military superiority, foot-dragging on a binding code of conduct, and expansive claims, already severely restrict their options, and this would be another blow in that respect. As for outside actors like the United States and Japan, they may rely even more on building ‘coalitions of the willing’ to emphasize the primacy of rule of law in the South China Sea in the absence of a clear verdict in favor of it in court. International discourse on the legality of South China Sea claims will also continue to lack the clarity and decisiveness of such a verdict. Needless to say, that’s not a very comforting thought. As China has shown over the past few years, it is perfectly willing to exploit ‘grey zones’ – conceptual or otherwise – to its own advantage.